Online Giving is Here ! 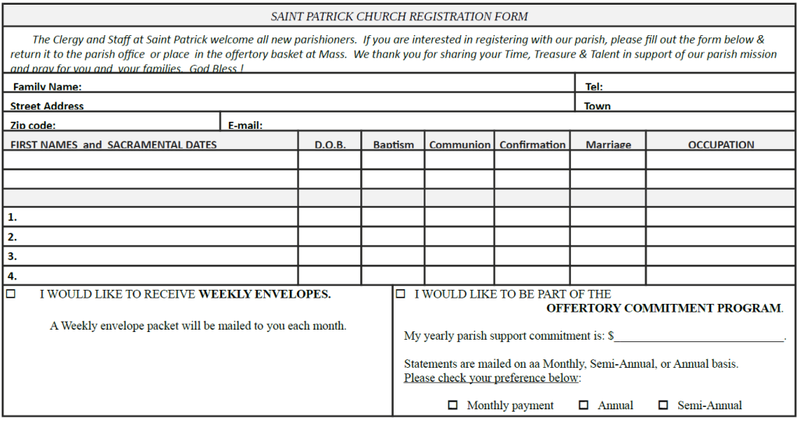 Saint Patrick parish now provides A convenient and safe way to make a one-time or recurring donation. Getting started is easy: just click the link below. When you participate, your gift will be securely transferred directly into the parish bank account. You won't have to remember to write a check or stop by the ATM on Sundays. Come be a part of our fabulous volunteer team! Hallmark Health VNA and Hospice located in Malden is looking for people who want to make a difference. Are you interested in visiting with hospice patients in the community, or maybe lending a hand administratively in our office? Also, we are a "We Honor Vets" Partner Level 1 organization and we are always looking for veterans who would like to volunteer and visit with other veteran patients. For more info or to volunteer, please give our Volunteer Coordinator, Allison Manheim Caplin, a call at 781-338-7863. AN OPPORTUNITY FOR GROWTH - NOT A CAPITAL CAMPAIGN! What a blessing to be part of such a giving community! As you know, the Diocese recently initiated The Increased Offertory Campaign at St. Patrick Parish, even though it is around the same time that we initiate our Grand Annual Campaign. Please do not feel overwhelmed. We can only do what we are able to do!! We would like to recognize all our parishioners for their generous response to our Increased Offertory Campaign. To those of you who have already made a commitment, thank you for your generosity and dedication to St. Patrick. To those who are still considering it, we appreciate your prayerful consideration. Electronic Giving Is Catching on at St. Patrick…Have You Signed Up Yet? If you haven’t done so already, please join us! It’s easy to sign up. Simply enroll on-line below under ONLINE DONATIONS. Please contact the parish office at 781-438-0960 to receive more information. One definition states: An acolyte is a cleric promoted to the fourth and highest minor order in the Latin Church, ranking next to a subdeacon. The chief offices of an acolyte are to light the candles on the altar, to carry them in procession, and during the solemn singing of the Gospel; to prepare wine and water for the sacrifice of the Mass; and to assist the sacred ministers at the Mass, and other public services of the Church. This may sound overwhelming, but I promise you, it is not. 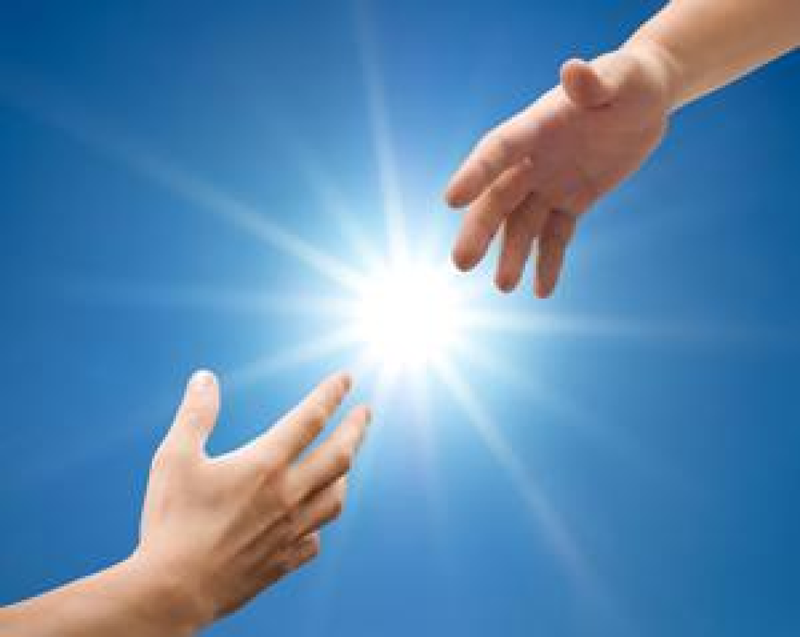 Nothing in the service of God and neighbor is overwhelming because God always helps us through. One of the most important ministries here at Saint Patrick Church is the ministry of Funeral Servers or “Acolytes” as we sometimes call them. When we read from St. Paul’s letter to the Corinthians (12:26) “If one member suffers in the body of Christ which is the Church, all the members suffer with that member” we may find ourselves being called into God’s service. We who are baptized into Christ and nourished at the same table of the Lord are responsible for one another. When a member of Christ’s Body dies, we, the faithful, are called to offer consolation to those who have suffered the loss of one whom they love. This ministry is part of the pastoral care by the community to those who have lost a loved one. If you feel this call, give Deacon Frank Dello Russo a call @781-438-2498 or email me at [email protected]. Thank you so much for your continued prayers and support for our church! 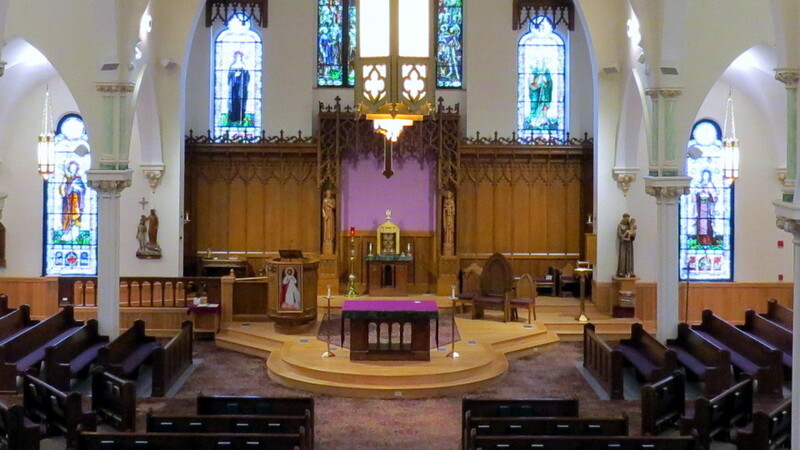 Our parish currently needs Pastoral Visitors who are willing to bring Holy Eucharist to and pray with the many faithful homebound parishioners who, due to illness or advanced age, are no longer able to join us for Mass. If you have considered serving in this manner, God may be inviting you to share his loving comfort through the beautiful ministry of Pastoral Care. For more information, please call Patrice Fitzpatrick at 781-438-0200. Like a family, Saint Patrick Parish has been there for us through the years, offering us the sacraments to strengthen us as we make our way on our earthly pilgrimage. We've made lifelong friends and enjoyed fellowship with friends old and new. Sunday Homilies, given in an engaging manner, have helped encourage us and to bring better order in our lives. We've enjoyed the hymns provided by our wonderful music department. Through our social outreach, we've better understood the needs of the less fortunate and how we can help them, particularly when we work together as a parish community. For those of us blessed with children, Saint Patrick Parish has formed and enriched them through our Religious Education Program and through Saint Patrick Catholic School both educationally and spiritually. Donation: You can make a one-time tax deductible donation or make a recurring donation by joining our Parish and becoming a registered member of this dynamic church. Planned Giving: as the diocese and the churches involved continue towards collaboration, we are a stand-alone Parish, please know that your planned gift to Saint Patrick Parish can ensure the legacy of our Parish. Wills and Bequests: Once you've taken care of your family, please consider a bequest to Saint Patrick Parish. If you decide to name Saint Patrick parish in your will, please notify me or the business manager so we may thank you. Insurance and Stock Gifts: there are several ways to turn insurance policies into charitable instruments. Stocks, bonds and other securities are also alternative ways to give that can benefit both you and Saint Patrick Parish. Thank you for considering St. Patrick Parish! If you would like to dedicate a leaf or rock, please print and complete the order form and return it with your check to Attn: Tree of Life, Parish Office, 71 Central Street, Stoneham, MA 02180. You may also place your form and check into the offertory collection basket. Please be sure to indicate “Tree of Life” on your envelope. If you have any questions, please contact the Parish Office at 781-438-0960. The “Tree of Life” order form will also be available in the Parish Office. The Tree of Life is an ancient symbol representing the interconnectedness of all things. With its branches reaching up into the sky, its roots deep down in the ground, the Tree of Life represents spiritual nourishment and the uniting of heaven and earth. A symbol used to comprehend and appreciate the life- giving, ever-bearing Spirit of God. I am introducing this to you as many people, parishioners and non-parishioners, have approached Father Frank and me as to the possibility of memorial gift opportunities at Saint Patrick Parish. A memorial gift opportunity is a specific item possessing religious, devotional or functional significance which serves to observe a donor’s special intention. It may be to remember a dearly departed loved one or sometimes it is to remember, in a special way, someone who is still alive. Since we have very few opportunities remaining aside from the Sacred Heart Statue and Baptismal Font in the main church, and two remaining stain glass windows, we will be introducing the Saint Patrick Tree of Life. A lasting dedication permanently displayed in the first floor entry to the Church and Parish Center, our new Tree of Life will be a beautiful sculpture cast in bronze and bearing “celebration” leaves. Its purpose will be to honor, recognize and memorialize those we hold dear while simultaneously supporting our parish. Your generous gifts will enable St. Patrick Parish to maintain and upgrade our facilities, establish new programs, and sponsor new events – all in order to better serve you our congregation, and our community. Please know that we are immensely grateful for your donation. Thank you for shining your light to enable us to continue to shine a light for others. The Little Sisters of the Poor in Somerville, MA is currently seeking a Part-time Driver/Gardener. Position requires experience transporting large groups, though CDL license not required. Mainly days, though some evening or weekend work occasionally needed. Must have excellent driving record. This position also includes gardening work during the spring through fall seasons. General knowledge of seasonal plant care necessary. Please contact Kathy Rice at 617-776-4420 Ext. 318 or [email protected]. Our Meals on Wheels Drivers deliver 2000 healthy meals, every weekday, to elders and adults living with disabilities. Our drivers may deliver the only meal of the day to our homebound clients in addition to providing critical social contact and safety check. These few moments of kindness make this service so much more than just the delivery of a meal. Today additional drivers are needed to meet the increasing demand for home delivered meals in our service area that includes 11 cities and towns. If you are interested in giving back to your community through this part-time job, apply today! Please call Sara at 781-324-7705 ext. 689 or visit our website www.mves.org/join-us/.